A joint is where two bones meet. Joints allow movement and flexibility between two bones. 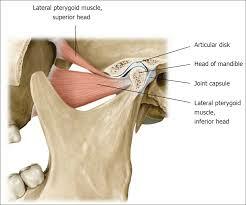 The jaw joint allows movement between the jawbone (mandible) and the skull. Muscles attached to the skull and jawbone cause the jawbone to move as the mouth is opened and closed. Pain in the joint area or nearby. The pain is usually located just in front of the ear, and it may spread to the cheek, the ear itself, and to the temple. Jaw movements may be reduced. This may be a general tight feeling or a sensation of the jaw getting stuck. Very rarely, the jaw may get ‘locked’, causing difficulty in opening or closing the mouth. Because the ear is very close to the jaw joint, some people get ear symptoms such as noise in the ear, sensitivity to sound or dizziness (vertigo). In general, TMJ disorders are thought to have a ‘multifactorial’ cause, meaning that there are usually a number of factors contributing to the cause. These factors can be grouped into two types: problems linked to the muscles working the joint, and problems inside the joint itself. The muscle problems are the most common type, particularly for younger people. Overactivity of the jaw muscles. This can occur if you clench your jaw a lot during sleep, which is quite common. Rarely, other conditions make the jaw muscles overactive. For example, there are some rare kinds of movement disorders (called orofacial dystonias) which cause excessive jaw clenching. Increased sensitivity to pain. We don’t know why this happens, but it may be linked to stress, or to some other process which affects pain sensitivity. Some doctors call this type of problem a pain syndrome because the exact cause of the pain is not known. 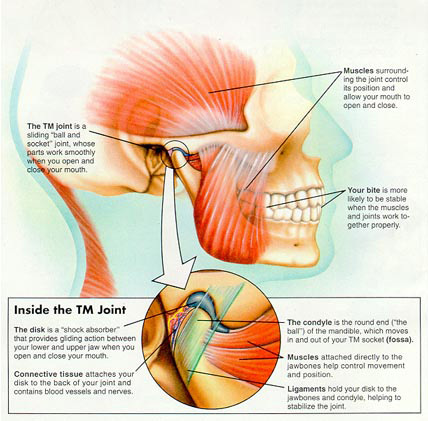 Muscular causes can be associated with stress, anxiety, clenching, bruxism; secondary component to all other forms of TMD; palpable muscle tenderness; often bilateral; provoked by activity (clenching, chewing, bruxism); confirmed by muscular management techniques and patient education regarding stress and other contributing factors. Wear and tear to the inside of the joint – for example, wear and tear to the cartilage. Sometimes this is due to osteoarthritis. This problem tends to affect older rather than younger people. You may feel pain along the joint, joint pain with movement, clicking of the joint, pain on clenching your teeth, odd movement of the joint – not a smooth movement when you open or close your jaw or notice that you can’t open your mouth fully. We will check how you move your jaw; how you bite; muscle tension; how you open your jaw; how it closes; neck mobility. Generally neck pain is present in all TMD cases; presence of upper cervical spine or head pain; accessory movement restrictions; unilateral or bilateral; multiple levels may be involved; confirmed with joint interventions. Approaching jaw problems from many angles has been shown to be effective at reducing symptoms of TMD. This entry was posted in Chiropractor Southampton and tagged acupuncture, jaw pain, neck pain, tension, yoga. Bookmark the permalink. ← What Can Yoga Do For You?